Most visitors begin their trip in Bangkok, a modern Asian city that offers a mix of hip restaurants, pulsating nightlife and traditional charm. You’ll find the sprawling Grand Palace at the heart of the historic Rattanakosin Island. Next to the Palace is the impressive Wat Pho, or the ‘Temple of the Reclining Buddha’. The northern city of Chiang Mai, with its beautiful old city, is home to more than 300 Buddhist temples, some of which are among the most important in Thai culture. Here you can explore the mountainous countryside on the back of an elephant. If it’s white sandy beaches you’re after, the resort island of Koh Samui is lapped by the clear waters of the Gulf of Thailand. If you love food, you’ll love the lemon and coriander-infused tastes of Thailand. One of the best ways to experience Thai food is from the many food stalls and stands that line the streets. It’s completely safe to eat the food which is probably as fresh as it gets – just make sure you choose a food stall that is already frequented by locals. Now the only thing you need to be concerned with is how hot you like your curry! Thailand’s famous nightlife attracts an international crowd of revellers. The Full Moon party on Koh Phangan is Thailand’s biggest and most infamous party, but party town Pattaya to the south of Bangkok offers plenty of entertainment all year round. Thailand accommodation ranges from cheap beachfront bungalows to some worldclass luxury hotels, with a range of options in between. Hostels are uncommon outside of Bangkok, although most Thailand hotels are relatively inexpensive. Tourist havens like Krabi, Koh Samui and Phi Phi Island offer an extensive range of accommodation, but if you want to escape the crowds, you may consider heading off the beaten track. The beachside town of Hua Hin offers some unique hotel options, while the northern province of Chiang Rai is a gateway to neighbouring Laos and Myanmar. Thailand offers a staggering array of shopping options, from colourful night markets to upscale shopping centres. For a uniquely Thai experience, take a guided boat tour of a Bangkok floating market, or head to the Chatuchak Weekend Market where over 8 000 stalls sell anything from puppies to pineapples. The Chiang Mai Night Bazaar is similarly famous in a country teeming with popular night markets. Brush up on your haggling skills but don’t forget that many of the designer brands on sale are in fact cheap counterfeit goods. 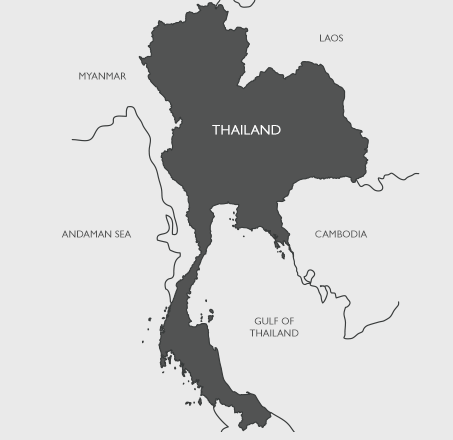 Thailand’s name in the Thai language is Prathet Thai, which means ‘land of the free’. It is the only country in Southeast Asia that was never colonised by a European nation. Thais are renowned for their friendliness and easy-going dispositions. Not surprisingly for a predominantly Buddhist nation, temple trips feature high on the agenda, so spend a morning of reflection at a local ‘wat’ before tracking down an outdoor street vendor for some tasty Thai cuisine. Visitors will do well to read up on the cultural etiquette of Thailand.